In September 1863, Confederate General Braxton Bragg’s Army of Tennessee was attempting to recapture Chattanooga, Tennessee from Federal forces by besieging the city. Union leaders responded by sending Major General Ulysses S. Grant and reinforcements to Chattanooga with orders to break the siege. After establishing a new supply line into the city, Grant ordered a breakout offensive in late November that successfully drove Bragg’s army back into northern Georgia. With the “Gateway to the South” secured, Union forces were well situated to launch an offensive aimed at capturing Atlanta. Following the breakout at Chattanooga, Grant was promoted to the special rank of Lieutenant General and placed in command of all Union armies. Grant moved his headquarters to Washington, DC, leaving his trusted subordinate, Major General William T. Sherman, in command of Federal operations in the Western Theater. Grant’s primary military strategy was a coordinated effort to attack and defeat the two main Confederate armies in the field, Robert E. Lee’s Army of Northern Virginia in the east, and Joseph E. Johnston’s Army of Tennessee in the west. On May 5, 1864, Grant launched his Overland Campaign against Lee in Virginia. Two days later, Sherman launched his Atlanta Campaign in the West. Employing a series of flanking maneuvers, Sherman persistently drove the Army of Tennessee south toward Atlanta. On July 17, 1863, Confederate President Jefferson Davis, relieved Johnston of his command and placed General John Bell Hood in charge of the Army of Tennessee. Hood proved more willing to fight than Johnston, but the results were the same. By July, Hood’s army was bottled up in Atlanta. On July 20, Sherman ordered his artillery to begin bombarding Hood’s lines, as well as the city, which still harbored about 3,000 civilians. The shelling lasted for five weeks, but Hood continued to hold on as long as he was receiving supplies. Toward the end of August, Sherman stopped the flow of supplies into Atlanta. With his main supply line severed, Hood evacuated Atlanta on the night of September 1, burning all military stores and installations. Sherman’s forces occupied the city on September 2, ending the Atlanta Campaign. After evacuating Atlanta, Hood reorganized his forces at Lovejoy’s Station, south of Atlanta, and Sherman chose not to pursue. On September 21, Hood moved north to Palmetto, Georgia, where he met with Confederate President Davis on September 25. Davis and Hood devised a plan that would have Hood’s 39,000 soldiers move north toward Chattanooga, destroying Sherman’s supply lines back to Tennessee along the way. Sherman was alerted to Hood’s intentions when Davis foolishly revealed the plan in a series of speeches on his way back to the Confederate capital at Richmond. Sherman responded by sending Major General George H. Thomas to Nashville on September 29, to organize all of the Union troops in Tennessee. He also sent troops to reinforce the garrison at Chattanooga. During October, Hood’s infantry and Major General Joseph Wheeler’s cavalry conducted a series of raids along the Western & Atlantic Railroad, Sherman’s main supply line from Chattanooga to Atlanta. Sherman’s army quickly repaired the damage but was not able to keep pace with the faster moving Rebels. By late October, Sherman convinced Grant that his time would be better spent making Georgia howl on his March to the Sea than by chasing Hood around the South. Consequently, Sherman turned the pursuit of Hood over to Thomas and about 60,000 soldiers, 30,000 of whom were in the Nashville area. The other 30,000, commanded by Major General John M. Schofield, were moving north to join Thomas. At the same time, Hood moved into northern Alabama and focused his attention on Tennessee, hoping to defeat Thomas before the two Northern armies could be united. After waiting to join forces with Major General Nathan Bedford Forrest’s cavalry, Hood left Alabama on November 21, 1864. His goal was Columbia, Tennessee, about midway between Thomas’s army in Nashville and Schofield’s army at Pulaski, about 75 miles south of Nashville. Anticipating Hood’s intentions, Schofield raced to Columbia, arriving just hours ahead of the Confederates on November 24. There, the Federals blocked Hood’s advance for five days by controlling an important bridge over the Duck River. On November 28, Hood found a way across the Duck River east of Columbia. In danger of being outflanked, Schofield began to fall back toward Franklin. Hood’s army attacked Schofield’s forces at Spring Hill, ten miles north of Columbia as the Northerners withdrew. After a series of command blunders, Hood ended the attack after dark. During the night, Schofield safely moved his entire army and supply train along the main turnpike past the sleeping Rebels. The movement did not go entirely undetected, but inexplicably, neither Hood nor any subordinate officers took any action to stop the Federal evacuation. By the morning of November 30, Schofield’s army was safely in Franklin, where the men engaged in building breastworks in a semi-circle in front of the town, but they had their backs to the Harpeth River. Here they awaited Hood’s next assault. The wait was not long. Enraged that the Federals had slipped past him at Spring Hill, Hood berated his subordinate officers and then ordered his army to resume its pursuit. Hood’s army began to arrive outside of Franklin at about 1:00 p.m. on November 30, 1864. Once in position, Hood ordered an all-out attack that began approximately at 4:00 p.m. Initially, the Confederates exploited a weakness in the center of the Union defenses, but the Federals were able to recover. Rebel attacks on both flanks were also unsuccessful. Repulsed on all fronts, Hood called off the assault after darkness descended. By 11:00 p.m. that night, Schofield’s army began crossing the Harpeth River and was on its way to Nashville. The Battle of Franklin was a devastating loss for the Confederacy. The Rebels suffered over 6,000 casualties, including 1,750 killed, compared to fewer than 2,500 Union casualties, including 189 killed. In addition, Hood lost fourteen generals (six killed, seven wounded and one captured), plus fifty-five regimental commanders. Most importantly, Schofield had once more escaped and was on his way to uniting his army with Thomas’s army in Nashville. Although Hood had lost his opportunity to defeat each of the Union armies independently, he still believed that he could best the combined Union army if he could get Thomas to leave his formidable defenses in Nashville and attack the Confederate army. Thus, Hood advanced to the outskirts of Nashville on December 2, and his men began building defensive fortifications. Thomas had little alternative than to oblige Hood. Thomas’s superiors in Washington feared that Hood might choose to bypass Nashville and launch an invasion of the North if Thomas did not act quickly. Grant was particularly assertive about imploring Thomas to confront Hood. Thomas, however, seemed to be in no rush to press the issue. Instead, he spent two weeks preparing his troops for battle and waiting for opportune weather conditions. Exasperated, Grant ordered Major General John A. Logan to Nashville on December 13, directing him to assume command of Thomas’s army if Thomas had not attacked Hood by the time of his arrival. Logan arrived in Nashville on December 15, the day Thomas finally acted. 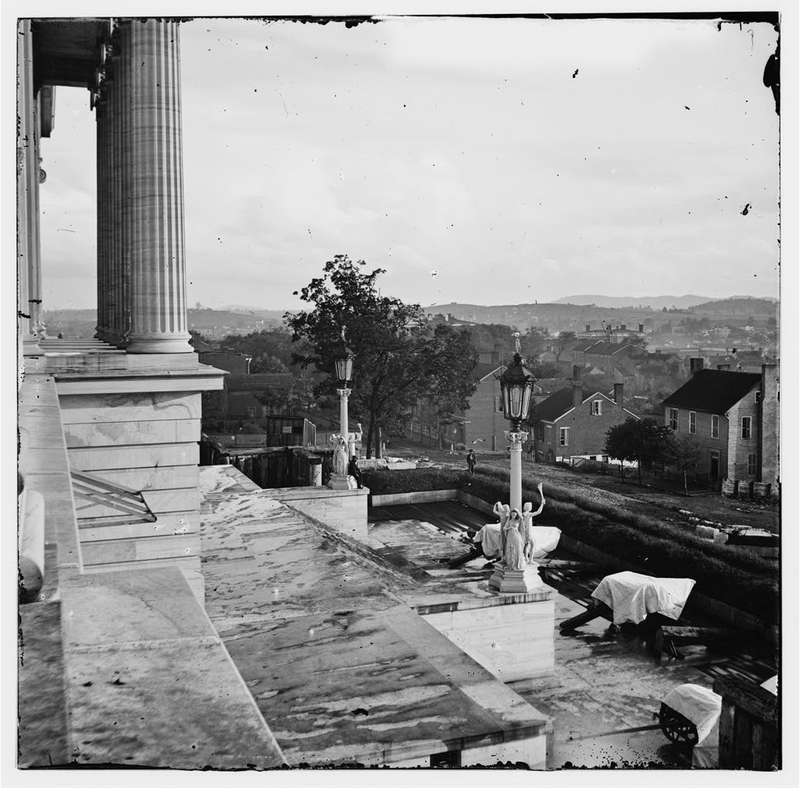 The Battle of Nashville began before dawn on December 15, when Thomas ordered one division, which included two brigades of United States Colored Troops, to assault Hood’s right flank. That attack, which served as a diversion, got under way by 8:00 a.m. and tied down the Confederate troops in that area for the remainder of the day. Thomas’s main attack began after noon on Hood’s left flank. A series of assaults by three Union corps overwhelmed the Rebels, driving them from their defensive fortifications. Before being able to press their advantage, however, the Federals were forced to halt when darkness fell. Hood used the delay to his advantage, reorganizing his troops and constructing new fieldworks during the night. Thomas spent the morning of December 16, redeploying his troops against Hood’s new line. At noon, the Federals renewed their assault against the exhausted Rebels, again concentrating on Hood’s left flank. At approximately 4:00 p.m., the Confederate line broke, but once more, darkness stopped the Yankees. Overnight, Hood consolidated the remnants of his army and withdrew south toward Franklin, ending the Battle of Nashville. As with other Civil War battles, casualty totals for the Battle of Nashville are hard to quantify with certainty. The Confederacy lost between 4,500 and 6,000 soldiers, including as many as 1,500 killed. The Union suffered between 2,000 and 3,000 casualties, including about 400 killed. After the battle, Thomas pursued Hood for the next ten days, but with the exception of a cavalry encounter south of Pulaski, on December 25, known as the Battle of Anthony’s Hill, the Federals never caught the retreating Rebels. On December 25, Hood’s main army re-crossed the Tennessee River into northern Alabama and headed back to Tupelo, Mississippi. On January 23, 1865, Hood resigned his command of the Army of Tennessee.